At the Oak Park - River Forest Chamber of Commerce, we understand that nonprofit organizations are businesses too. Don't let the corporate structure or bottomline fool you - nonprofits have the same struggles of marketing, product, administration, overhead and HR. Sure, there are some twists: volunteers, social mission, different funding / capital structures. But these local organizations are small businesses too - and small business is hard! Chamber membership can help make it easier. Hephzibah was the member recipient of proceeds from the 2018 Retail Warehouse "Presale Tickets"
Chamber benefits are plentiful - so much so that it can be overwhelming! Let us help you customize your experience and identify the benefits that meet your needs. Whether you are looking for brand recognition, exposure, new board members, donors or simply the "typical" things a local business needs to be successful (advocacy, information, education), we are sure you will find that Chamber membership is a valuable proposition. Give us a call! What the !@#? is GLIBQUAPS? Nonprofit organizations belonging to the Chamber were invited to give 225 seconds to present their organizations to our February 2018 Young Professionals group using no more than 15 slides. Modeled after the international "Pecha Kucha" craze, GLIBQUAPS stands for "giving lots of information by quickly using auto-advancing powerpoint slides." This unique presentation style is all the rage, using auto-advancing powerpoint slides, forcing presenters to get their messages across FAST! Honestly, I don't remember what the name stands for.... but if you missed the event at Wild Onion's Tied House in Oak Park, click on the links below to see the presentations from these fine Chamber Members! The Chamber looks for creative ways to engage with nonprofits, help them make connections in the community and help spread their message. GLIBQUAPS is one of the many examples of how we do that - and have fun too! 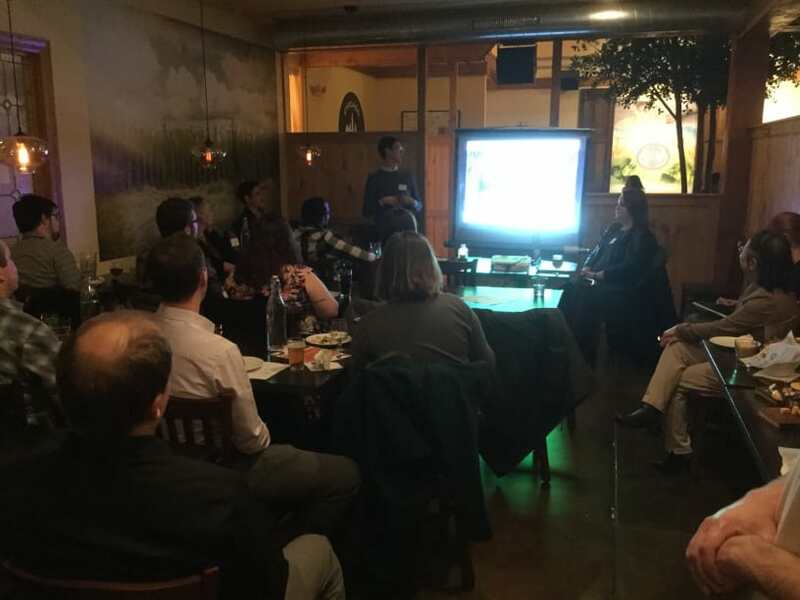 Young Professionals gathered at Wild Onion's Tied House to hear 17 super-speedy pitches from local nonprofits - while enjoying the ambience and craft beers at Tied House!